JAISAL NOOR, TRNN PRODUCER: Welcome to The Real News Network. I’m Jaisal Noor in Baltimore. And welcome to this latest edition of The Ratner Report. We’re now joined by Michael Ratner. He’s president emeritus of the Center for Constitutional Rights in New York, chair of the European Center for Constitutional and Human Rights in Berlin. He’s also a board member for The Real News Network. MICHAEL RATNER, PRESIDENT EMERITUS, CENTER FOR CONSTITUTIONAL RIGHTS: Good to be with you again, Jaisal and The Real News. RATNER: Well, this week was a pretty big week, an important week in the Bradley Manning case. On Thursday, July 18 at Fort Meade, the Manning trial is continuing. And it continued with really a major, major issue, which is the question of whether the judge would continue to allow the prosecution of Bradley Manning on the aiding the enemy charge, as well as a couple of other charges having to do with computer fraud and stealing government secrets. But the big one is the question of the aiding the enemy charge. And the judge made a decision on that today which I want to talk about. I want to catch people up so that they know where we are on the Manning trial. The government has completed its direct case. The defense did its case. And now the government is beginning a short rebuttal case. There will then be summations by both Bradley Manning’s lawyer as well as the government lawyers. The judge will then make a decision. There’s no jury in the case. 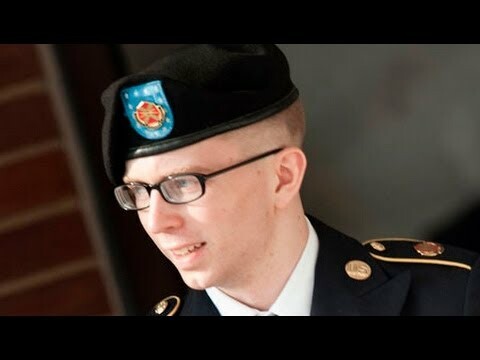 And once that decision is made, they will go right into the sentencing phase, in which Bradley Manning can put on evidence to mitigate the sentence, assuming he’s convicted of some charges. That’s where it is. But the big thing that happened this week was this government was–the big thing that happened this week was the defense effort to get the aiding the enemy charge dismissed. And I’m not going to hold it back. The judge refused to dismiss the aiding the enemy charge against Bradley Manning. And, of course, it’s the most serious charge. Bradley Manning has already pleaded guilty to about–charges that could get him about 20 years in prison. The other charges could–if you add them all up, could give him another hundred years in prison. But the aiding the enemy charge itself provides for a death penalty. Government has said they wouldn’t go for it. But it also provides for life in prison without parole–really, really serious. Now, I should say the government–the judge refused to dismiss the case on aiding the enemy. But I want to make an important point here. That doesn’t necessarily mean that Bradley Manning will be found guilty of aiding the enemy, because the standard on a motion to dismiss a criminal charge before the end of the trial is that the judge has to look at the evidence, find only the prosecution’s evidence in the most favorable light for the prosecution. Assuming the judge did that, which is what she said she did, she then can find any inference in favor of the government, and she says, well, there’s enough of the elements here that have been proven at this point for me to sustain the charge going forward. That doesn’t mean that–in the verdict phase that she will necessarily find Bradley Manning guilty, because of course that takes her finding of beyond a reasonable doubt. On the other hand, you have to look carefully at what she said. And to me the fact that she even upheld this charge is so completely outrageous. I mean, I’m beginning to think after 40 years of being a lawyer that I’m naive. I never would have expected this aiding the enemy charge to be upheld. Let’s talk about what it is. What is aiding the enemy? It’s–applies only to people in the military, and it’s a statute that says if you give intelligence directly or indirectly to the enemy, you can be considered to be aiding the enemy. So let’s look at the elements. The enemy here, the government says, is al-Qaeda or al-Qaeda in the Peninsula, the Arabian Peninsula. They say that there’s intelligence that was given, which of course would be the Iraq War Logs, the Afghan War logs, other material that Bradley Manning uploaded to WikiLeaks. The government then put in evidence that al-Qaeda, Osama bin Laden, actually asked for some of those documents from some of his aides and actually received some of those documents, and they were found on his computer in that house in Pakistan. The government theory here is that Bradley Manning, by giving these documents to WikiLeaks, indirectly aided the enemy because the enemy got them from WikiLeaks. Now, it’s true that Bradley Manning gave them to WikiLeaks. He could have given them to The New York Times, which he tried to do, and presumably al-Qaeda or Osama bin Laden would have gotten them from The New York Times. So it’s not necessarily here about WikiLeaks. It’s about the fact that when Bradley Manning gave them to a journalist or a publisher that could be read–and the documents could be read on the internet, the, quote, enemy could read them. The judge did say there has to be a standard by which Bradley Manning must be found to have violated it, which is that he has to prove–the government has to prove that for Bradley Manning to be found guilty he has to have actual knowledge–actual knowledge, I want to repeat–that by giving to WikiLeaks, he was giving intelligence to the enemy. So I looked at that standard and I read a lot of the material that the government was relying on, and I said to myself, there’s no way in the world. Bradley Manning did not have actual knowledge that by giving 750,000 documents to WikiLeaks, that the enemy would actually read it. He did not have actual knowledge at the time he did that. And the government’s claim on that was actually, I thought, quite weak, which is why the judge’s ruling surprises me. They claim that Bradley Manning read a 2008 government intelligence report that talks about WikiLeaks. It’s a study of WikiLeaks and what the dangers are of WikiLeaks and the dangers to the United States and national security, etc., and its conclusions are that WikiLeaks, quote, was a potential threat that could be used by the enemy, in other words, not sure at all. And there was also this question: will WikiLeaks be used by a terrorist group? None of it, assuming Bradley Manning read that report, none of it actually says the enemy will read what is put on WikiLeaks. That was a key piece of evidence that the judge used, that the prosecutor used to find that Bradley Manning had actual knowledge that the documents he gave to WikiLeaks would be read by the enemy. In fact, what’s interesting about this and what came out at some of the testimony is that Osama bin Laden and al-Qaeda didn’t even go to look at the WikiLeaks documents until after they came out and the government started saying the WikiLeaks documents are damaging the national security. They’re aiding the enemy. At that point they become prominent, the documents, and the, quote, enemy looks at the documents. But let’s look at how serious this is. Under the government’s theory, any military whistleblower who gives to any media documents that he’s whistleblowing or she’s whistleblowing is almost automatically guilty of aiding the enemy. Let’s say they had been given to The New York Times, The Washington Post. I assume our enemies, al-Qaeda, reads The New York Times and The Washington Post. And the best example, of course, is when The New York Times published the warrantless wiretapping story in 2005 that President Bush was warrantlessly wiretapping the phones of all of us here in America and all of the calls we made overseas, our calls we made overseas. Obviously al-Qaeda was going to read that story in The New York Times. That would make the person who gave that information to The New York Times, assuming they were in the military, which they may not have been in that case, but if they had been, guilty of aiding the enemy. What I say to this is that first there was not enough evidence to say that Bradley Manning had actual knowledge he was aiding the enemy. But even worse, what the judge did here was rule that the intent of Bradley Manning was not relevant to the charge. So Bradley Manning is sitting there. He says publicly, I am releasing these documents because I want the American people to see them, I want them to debate the issues. Nothing about aiding al-Qaeda or the enemy. That’s what he said. His intent was clear. He wanted to get the public debate going in the United States on these issues. But the judge ruled that intent was not what the government had approved. Of course, if intent is necessary to the statute, which I think it is, and I think any appellate court will say it is, there’s no way Bradley Manning could be found guilty, because he obviously didn’t intend to aid al-Qaeda. But it’s an incredibly dangerous precedent that the judge has set by not dismissing it. It makes the publisher, a publisher, whether it’s WikiLeaks or The New York Times into the indirect aider of the enemy. Everything they publish that the enemy can read, classified or not, becomes aiding the enemy. So I can’t say–I actually have to say I’m surprised by the verdict, because when I–not the verdict; I’m surprised by the failure to dismiss this case, ’cause as I said, when I read the evidence, it’s just not there. And even if Bradley Manning is found not guilty of this charge, which I hope he will be–I mean, I hope to heaven he will be–it’s still the fact that it was upheld on this nutty theory to me sends a terrible message to whistleblowers and to media throughout the country. NOOR: Michael Ratner, thank you so much for this very important update.